Biography of the Day: General William Wing Loring, C.S.A. Born to Reuben Loring and Hannah Kenan Loring in Wilmington, North Carolina, William Wing Loring moved with his family to St. Augustine, Florida, when he was a small child. As a teenager he fought in the Second Seminole War and rose to the rank of second lieutenant. His parents then sent him to the District of Columbia to attend Georgetown College. After leaving that institution, he studied law and was admitted to the Florida bar. He was also interested in the new state of Florida’s political situation and was elected to the state legislature in the early 1840s. At the outbreak of the Mexican-American War, Loring received a captain’s commission and commanded a company of mounted rifles. He was promoted to major shortly before Winfield Scott’s Mexico City campaign. On the march to Mexico City, Loring participated in all of the major engagements. He received two brevet promotions and lost his arm in the battle of Chapultepec. At the end of the war, he remained in te regular army and was promoted to lieutenant colonel in March 1848. With his regiment he made a heroic march from Texas to Oregon and assumed command of the Department of Oregon in 1849. He remained there for two years before being transferred to Texas in 1851. He was promoted to colonel in 1858. 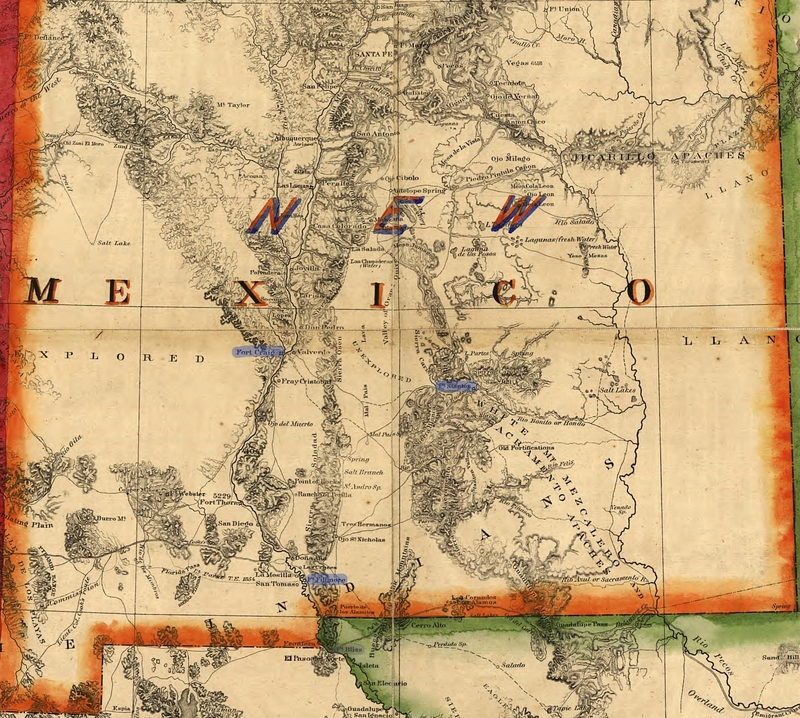 At the end of 1860, Loring assumed command of the Department of New Mexico, headquartered at Santa Fe. During March 1861, after the secession of Texas, he grew increasingly concerned for the security of his department. At the same time, he was wrestling with his own decision about whether to follow Florida out of the Union. He expressed views against the doctrine of secession, but apparently the impending secession of his native state of North Carolina decided him on the issue. He resigned his commission on 13 May 1861 and offered is services to the Confederacy. He was commissioned a brigadier general in the Confederate army on 20 May 1861. In July 1861, Loring was given command of the Army of the Northwest in western Virginia. Throughout the remainder of the summer and fall of 1861, Loring led his men in a futile attempt to prevent Union forces from gaining a foothold in that area. In early August, General Robert E. Lee, who had been sent to western Virginia to advise the commanders there, urged Loring to attack the Federal position at Cheat Mountain. Loring resisted. Finally, because of the discovery of a route that would allow a secret approach overlooking the Federal position, Loring, with Lee present as an advisor, advanced on the position. The attack, planned for 12 September 1861, was never completed because of faulty intelligence. At the end of the year, his Army of the Northwest was brought under the overall command of Thomas J. “Stonewall” Jackson. From the very beginning, Loring chafed under this arrangement, and when the ensuing campaign produced few results and it appeared his disgruntled army would be spending the remainder of the winter in comfortless Romney, Loring and his officers requested that they be removed from Jackson’s command. To Jackson, such action smacked of insubordination and threatened to tear his entire army apart. It was truly a thorny situation for the War Department. 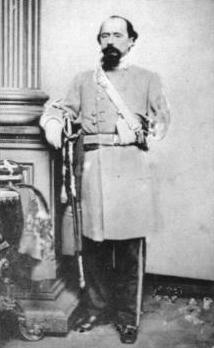 In February 1862, Loring was promoted to major general and shortly afterward was summoned east so that a more suitable command could be found for him. Temporarily placed in command of the Confederate defenses at Suffolk, Virginia, on 8 May 1862 Loring was given command of the Department of Southwestern Virginia. Through the summer of 1862, Loring defended his department against Union invasion from the Kanawha Valley. In August 1862 he defeated a Union Force at Pack’s Ferry on the New River, and in September he launched a short, though relatively successful, invasion into the Kanawha Valley. On 27 November 1862 he was transferred to the command of Lieutenant General John C. Pemberton at Jackson, Mississippi. General William Wing Loring, C.S.A. During the next six months Loring commanded a division under Pemberton in defense of Vicksburg. In March 1863, Pemberton sent Loring north of the city to stop the Federal movement against Yazoo Pass. Loring built Fort Pemberton and repelled the Union offensive. In April 1863, Loring used his division to combat Union colonel Benjamin Grierson’s raid into Tennessee, and on 25 April he prevented the town of Enterprise, Mississippi, from falling to Grierson. By May 1863, relations between Loring and Pemberton were somewhat strained. Loring disagreed with many of Pemberton’s decisions regarding the defense of Vicksburg, and during the battle of Champion’s Hill on 16 May, he failed to carry out Pemberton’s orders to attack the Union left flank. Loring, charged with guarding the subsequent Confederate retreat back to Vicksburg, managed to separate his division from the remainder of the army and was forced to join General Joseph Johnston’s force outside of Jackson, Mississippi. As a result, Loring missed the siege of Vicksburg and the surrender of the remainder of Pemberton’s army. Loring served under Johnston for the remainder of the summer, fighting at Jackson after the surrender of Vicksburg. For the remainder of the year into early 1864, Loring and his division were headquartered at Canton, Mississippi. In early 1864, serving under Lieutenant General Leonidas Polk, Loring commanded his division in the attempt to stop William T. Sherman’s Meridian campaign. Failing to stop Sherman, Loring moved his division to Montevallo, Alabama. As part of Polk’s Army of Mississippi, Loring moved into north Georgia in May 1864 to join Joseph Johnston’s efforts to stop Sherman’s move toward Atlanta. He commanded his division in the early phases of that campaign, and when Polk was killed on 14 June, Loring assumed command of the Army of Mississippi, effectively a corps in Johnston’s army. Loring led his corps through the remaining engagements of the campaign and moved north with General John Bell Hood after the fall of Atlanta. He fought under Hood in the disastrous battles of Franklin and Nashville. In early 1865 he took what was left of his army to join Joseph Johnston in the attempt to slow Sherman’s march through the Carolinas. In April 1865 he surrendered with Johnston in North Carolina. 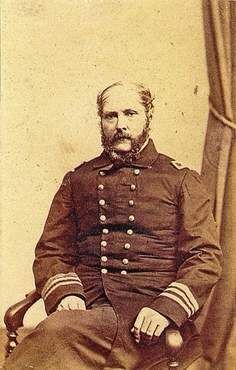 After the war, Loring engaged in various business activities in New York City, but, missing the military life, in 1869 he accepted a brigadier general’s commission in the Egyptian army. For ten years he fought with distinction in several Egyptian campaigns. He returned to the United States in 1879. In retirement in New York City, Loring wrote extensively about his varied military career. He died of a heart attack in New York City on 30 December 1886. Raab, James. W.W.W.Loring – A Biography (1997). Wessels, William L. Born to be a Soldier; the Military Career of William Wing Loring of St. Augustine, Florida (1971). MANASSAS, Virginia — The cannons boomed and the guns flared as the mists of times parted, and north and south squared off again on a Virginia field in a living reminder of the first major battle of the Civil War. “We know the war is over,” said Ron Miller, proudly attired in the uniform of the southern Confederacy, which went on to win this battle 150 years ago, though not ultimately the war. This weekend, under baking hot temperatures, thousands of spectators were gathering to watch a re-enactment of the Battle of First Manassas/Bull Run, fought on July 21, 1861 at Manassas, in the southern state of Virginia. 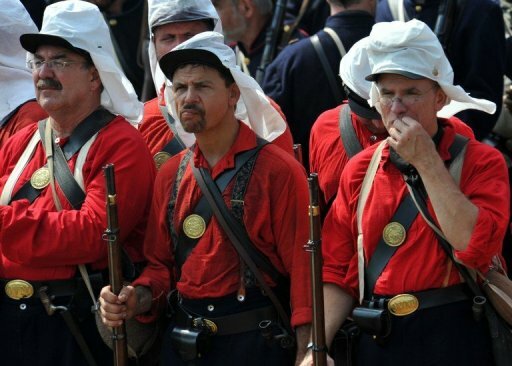 Miller, whose great-grandfather and great-great grandfather fought in the four-year Civil War, is one of hundreds of history fans who at weekends don the uniforms of their forefathers and reenact battles from the war that forged modern-day America. “Look how they load the cannon,” Miller, 60, told children watching him intently as more than 8,700 reenactors as well as some 375 cavalry horses from the US, Canada and Europe were Saturday and Sunday recreating history here. 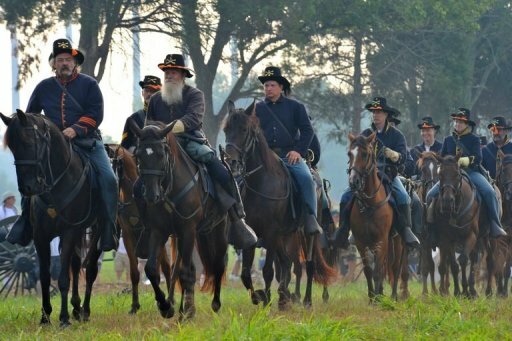 The re-enactment of the battle is just one of hundreds of events being held around the United States to mark the 150th anniversary of the start of the 1861-1865 war. “I’ve always been fond of history,” Miller told AFP, saying he was inspired by the tales handed down by his relatives. His great grandfather had even enlisted at 14 and fought in every major engagement. Across the vast site outside Manassas, white tents were erected to serve as bivouacs and give historical insights into life in this corner of the South, 150 years ago. A man dressed in the style of a French Zouave soldier was taking a nap, as lone violinists played softly nearby. Despite the baking sun, Kevin Zepp, 60, stood tall in his simple gray wool trousers marked with the colors of his Alabama regiment. “If you were a farmer or a worker in a factory, you had these trousers. It’s like the modern jeans, you put the military stripes on it,” he explained. Sheltering under a tree, Karen Quanbeck, 52, explained that she was playing the role of Catherine Barbara Broune, a peasant woman who had worked with her brother, a priest, to transport the wounded and find medicines. And while this weekend’s events hold a special historical significance, there are hundreds of volunteers who dress up in costumes throughout the year to bring the Civil War back to life across the country. War broke out in April 1861 soon after 11 southern states formed the Confederate States of America. While the exact causes of the war are still hotly debated, there is no doubt that an over-riding issue was slavery. The agricultural South relied heavily on slaves to work their rich cotton plantations and feared the new US president, Abraham Lincoln, would eventually set them free. While Lincoln declared an end to slavery in 1863, race relations remain one of the nation’s most divisive issues. “A lot of differences we had during the civil war do exist today — the state rights, the race relations — there’s a lot of things we can still work out today,” said Dennis Rabida, 46, from New Jersey. Retired soldier Dan Byers said he had come to “honor his ancestors,” recalling that the northerners had “invaded our country,” the South. The clashes in Manassas were ferocious, pitting a northern Union army of some 30,000 against a slightly smaller Confederate force. In the end, the Confederates won the battle, although they were to go on to lose the war. About 5,000 troops on both sides died on the Manassas battlefield that day, but by the end of the war, the toll was 600,000 lives lost. GULF SHORES, Ala. (WALA) – Once buried by the sands of time, a 150-year-old shipwreck off the Alabama coast was uncovered by a local exploration group a few years ago. Thursday, they unveiled some of what they found. Fathom Exploratoin has been staying quietly busy the last few years. It was permitted to survey the gulf waters off Fort Morgan in 2004, and it didn’t take them long to find something unexpected. It was a shipwreck, but not from the turn of the century like they had anticipated. “So as you look over a huge wreckage pile, you look for hints of what might be going on,” said David Anderson of Fathom Exploration. Unveiled for the first time Thursday was one of the first artifacts David Anderson brought up from the waters on Mobile Bar – a 31 inch, 700 pound bronze bell that was much too large to be a ship’s bell. Anderson knew he’d found something special when he first discovered the bell, but it wasn’t until he began cleaning it and a number appeared that he realized that it was really something special. “When the 1860 date on the bell came out, we really had to take a step back and go, ‘Wait a minute. What is this? '” said Anderson. After much research, the ship’s story began to unfold. It was June 5, 1861, and the British Bark “Amstel” was making haste to the port of Mobile. Their goal was to pick up a load of cotton before Union ships blockaded the mouth of the bay. They ran aground on Mobile Bar – the Dixie Bar as it’s now known. By the time a salvage vessel returned to get the cargo, Union ships had arrived. The salvage vessel was confiscated and the Amstel was left to rot. “When we realized this was the first naval engagement here – when we started digging throught the archives and doing the research – it became even more significant,” said Anderson. Other items discovered on board were pre-Civil War era railroad axels and huge slabs of Pennsylvania stone. The bell and stone are believed to have been going to a building project somewhere in Alabama or Mississippi – another mystery the group is trying to unravel. 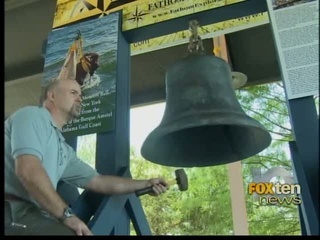 The bell will be on display at Lulu’s in Gulf Shores for about a week. Fathom Exploration will continue the salvage operation over the next few years, partnered with the Alabama Historical Commission, and under the authority of the United States District Court. Sunday marks the 150th anniversary of the ship running aground.